This month our theme is Wholeness and we want to offer opportunities for all of us to practice self-care and to engage in healing experiences. Part of healing is creating spaces of radical welcoming and unconditional love. For many of us who identify as Lesbian/Gay/Bisexual/Transgender/Queer/Two-Spirit/Gender-not-conforming, our spiritual journeys have not always contributed to our wholeness, self acceptance, and unconditional love of ourselves. Some of us were rejected by our families and/or churches and found in Unitarian Universalism a refuge and a family of choice. Celebrating Pride is much more than parades and rainbow flags. It is celebrating life in community, and remembering so many of us who are no longer with us because of homophobia. Celebrating Pride is dancing in the streets, marching in protest, demanding rights at the legislative level, and saying Amen! to the affirming and loving words offered to us from the pulpit on Pride Sunday. 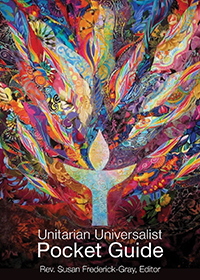 We at Starr King Unitarian Universalist Church in Hayward are proud to be a Welcoming Congregation. This means that this courageous and loving congregation has called as your settled Ministers, two who identify as Gay (Rev. Mark Belletini) and Queer/Two-Spirit (me). It means that our Religious Exploration curriculum is inclusive and affirming of a all diverse sexual orientations and gender expressions and that we support and attend the Hayward Gay Prom. It means that we believe that love is love and we happily officiate weddings for couples who love each other, support our LGBTQ2 families, and care for our LGBTQ2 elders. For me, celebrating Pride is a sacred ritual that affirms my coming out as part of my spiritual journey, connects me with loving community, and reaffirms my calling as a Unitarian Universalist Minister who identifies as Queer/Two Spirit. I cannot separate my calling from the intentional ongoing practice of journeying towards wholeness. Celebrating our Pride within a loving community affirms our belief that we are sacred and welcome. This year marks the 50th anniversary of the Stonewall riots which ignited the LGBTQ2 Movement. We will have not one but two Pride celebrations. On April 7 we celebrated Pride with our wonderful guest musicians, the Rainbow Women’s Chorus. Then, on Sunday, June 30th, we will celebrate Pride again with another festive and affirming service.